Porcelain fused to metal restorations have been offered to patient as an option for fixed partial denture since 1960s . The use of the metal as substructure increases strength and provides support, while the use of porcelain ensures esthetics. However, opacity and dark color of the metal obstruct the reflection of the natural tooth color in the restoration . Increased esthetic demands from the prosthetic restorations, requirement of the restorations that have similar optical properties to tooth structure are possible factors to trigger development of the all-ceramic restorations . Alongside the esthetic advantages of all ceramic restorations need to be durable as well as porcelain fused to metal restorations. The all ceramic systems sufficiently resist to compressive stresses, whereas they are weak against to strain forces. Zirconia based ceramic restorations have been widely accepted in dental applications, due to superb biocompatibility and mechanical properties . In recent years, more translucent zirconia monolithic systems have been introduced, but feldspathic porcelain veneered zirconia fixed partial dentures are still presented more esthetic results . Clinicians usually prefer the zirconia based porcelain restorations that are fabricated using a CAD/CAM system for substructure, due to more accurate fit of the restorations . Two different CAD/CAM techniques are frequently used in this manner. These are soft milling and hard milling techniques. Pre-sintered zirconia blocks are milled in the soft milling technique and the milled restorations shrink dimensionally 20% to 25% after the final sintering procedure. Completely sintered zirconia blocks are milled in exact dimensions of the restorations without any thermal or sintering process . Zirconia substructure in zirconia ceramics obtains adequate strength for the restorations. Clinical follow-up studies proved that porcelain veneered zirconia restorations served successfully in oral environment without any complications up to 5 years [8,9]. However, incidence of fracture or chipping in the veneered porcelain is still high and the zirconia substructure can be exposed. This failures are frequently observed issues for zirconia ceramics . Cause of damages may be induced by various factors in the zirconia based restorations. These are sintering procedure of zirconia and structural defects [11,12], airborne particle abrasion , planning of substructure [14,15], type of margin design , multiple firings [10,17-19], aging of zirconia  and luting procedure . Remaking or repairing the failed restorations are probably primary treatment options when encountered to fractured porcelain. The failed restorations have to be removed from the mouth, but this is either time-consuming or open to complication. The restorations can be repaired using intraoral repair systems into the mouth. This technique may increase serving time of the restorations, save on the time and possible costs, and eliminate removal of the failed restorations for remaking or repairing . The success of the intraoral repair systems affects from bonding between the composite resin and surface of the restoration . Various surface treatment methods may be applied to the surface of failed restoration, in order to enhance bonding strength. Apart from the instructions manual, several surface treatment procedures were described in the literature such as, intraoral airborne particle abrasion, tribochemical silica coating, acid etching, short or long pulse of laser irradiation [18,23-25]. Esthetics and color harmony of the intraorally repaired restorations are important issue as well as strength of them. The clinicians easily restore shape and form of the failed restorations, but reflection of accurate shade on the restoration is a major drawback of this repairing method . Thickness of veneered porcelain , number of firing [17,19,28], firing temperature and parameters [17,18], material of substructure  and applied surface conditioning method on the substructure , play key role on to final shade of the porcelain restoration. Multiple firings during the preparation of the restoration can weaken the bonding between the porcelain and the zirconia, which may lead to fractures and chipping in the porcelain [10,18,30,31]. Beside to connection errors that prompt by repeated firings, porcelain color changes also stated that in the literature [17,19]. Color incompatibilities may occur between the repaired area and rest of the restoration. The aim of this study was to evaluate color stability of repaired multiple fired zirconia substructures that were fabricated using CAD/CAM technology and repaired two different intraoral repair kit. The null hypothesis of the current study was that increasing number of firing has no effect on color differences of the repaired restoration. Eighty disc shaped (5 mm diameter and 2 mm height) zirconia (ICE Zirkon Translucent, Zirkonzahn GmbH, Gais, Germany) specimens were fabricated using CAD/CAM system. Shade of the specimens was A1 according to Vita Classical Shade Guide (Vita Zahnfabrik H. Rauter GmbH & Co. KG) (Figure 1). 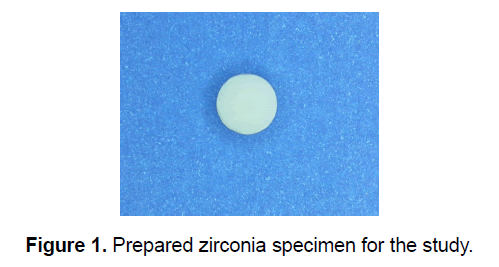 Figure 1: Prepared zirconia specimen for the study. Color measurement of all specimens was performed over a black background using a digital spectrophotometer (Vita Easyshade Advance 4.0, Vita Zahnfabrik H. Rauter GmbH & Co. KG) under D65 light source. Measured values were recorded in CIE L*a*b* system. The specimens were devoted to two groups for different intraoral porcelain repair systems (Ceramic Repair N, Kuraray Noritake Dental Inc, Okayama, Japan, and Clearfil Repair, Ivoclar Vivadent AG, Schaan, Liechtenstein). This groups were sorted to four subgroups (n=10) regarding number of firing (1, 3, 5 and 7) (Table 1). Table 1. Definition of the tested groups in the study. Specimens into the subgroups were fired using standard parameters of porcelain baking in the porcelain furnace. After the firing process, the specimens were repaired using related intraoral porcelain repair kits according to group. Dental composite resin of each repairing systems was applied to the specimens via teflon mold (2 mm x 2 mm). L*a*b* values of fired and repaired specimens were recorded again over the black background (Figure 2). The ΔE values between zirconia and fired-repaired zirconia specimens were calculated with the formula. 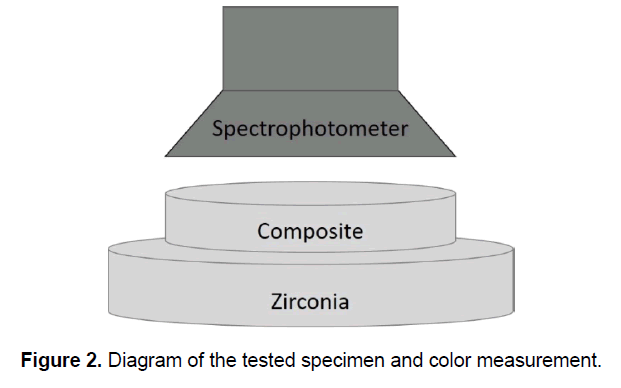 Figure 2: Diagram of the tested specimen and color measurement. Change in translucency was evaluated using ΔTP formula between color measurement (L*a*b* values) over white and black backgrounds after the repairing procedures. The acquired data showed that homogeneity according to Shapiro-Wilk normality test of analysis of variance. (p<0.05) Two-way ANOVA statistical test was applied using a statistical software package program (PSPP 1.0.1, GNU, FSF Inc, Boston, MA, USA). Post Hoc test was used multiple comparison of the groups. If the ΔE value is above 3.7, the color difference can be perceived by the eye. If the ΔE value is above 5.5, the color difference is clinically unacceptable. The mean ΔE values of the groups were compared with clinically detectable limit (ΔE=3.7) and clinically acceptable threshold (ΔE=5.5). The lowest mean ΔE value was found in Group K1 (ΔE=3.57), and this was under the clinically detectable limit. Also, other groups which applied Clearfil Repair kit illustrated lower than clinically detectable limit. The highest mean ΔE value was observed in Group K7 (ΔE=4.70) (Table 2). The difference of mean ΔE values between Group K1 and Group K7 was statistically significant. Table 2. Mean ∆E and ∆TP values of the groups. ǂThe highest value of ∆E and ∆TP. The mean ΔE values of groups that repaired Ceramic Repair N were higher than the clinically detectable and acceptable thresholds. The highest mean ΔE value (ΔE=6.24) was seen in Group C7 among the tested groups. For the Ceramic Repair N applied groups, the lowest mean ΔE value was found in Group C1 (ΔE=6.07) (Table 2). However, the differences between the mean ΔE values of the Ceramic Repair N applied groups were not statistically significant. According to the results of the statistical analysis, effects of the applied repair systems, number of firing, and the interactions between them were found to be significant. ΔTP value were perceivable by the eye, if it was over 2.32 Mean ΔTP values of Group C1 (ΔTP=3.01) and Group C3 (ΔTP=2.07) were observed higher than the perceptibility limit. Mean translucency parameter differences of the groups showed that lower values than the limit (Table 2). For the Ceramic Repair N applied groups, the differences between Group C1 and Group C5 and C7 were found statistically significant. Any statistically significant differences were seen among the Clearfil Repair applied groups. The effects of the applied repair systems and number of firing were found to be significant with regard to statistical analysis of translucency parameter differences, but any significant differences were not observed at interactions between them. In this study, the differences between the initial color of the milled zirconia specimens and the color after the repairing procedure, and the translucency were analyzed by applying two different intraoral porcelain repair systems and various numbers of firing. The null hypothesis of the current study was rejected. Color differences between the zirconia and the repaired zirconia with composite resin were found high related to number of firing. Similarly, mean translucency parameters were decreased parallel to number of firings of the zirconia specimens. The most common failure reason in the zirconia ceramics is crack or chipping in the porcelain and zirconia substructure may come into the open oral cavity . Several studies stated that repetitive firings during the preparation weaken of the connection between the porcelain and the zirconia [10,18,30,31]. The bonding failure that is generated by multiple firings can also cause to color change in the restoration, beside to increased risks of fracture and chipping [17,19]. Possible factors that caused to failure should be considered, when the clinician faced to cracked or chipped restoration. Effect of multiple firings process should not be ignored to cause fracture of zirconia based porcelain restoration as well as the main factors, such as sintering procedure of zirconia, structural defects, type of margin design, etc. [10-21]. Vichi et al. investigated effect of multiple firings on to flexural strength of zirconia ceramics, and reported that three firing processes significantly increased the strength. They suggested that to do 3 times baking instead of one baking, and also added that 5 times baking would be applied to achieve better esthetics and this did not significantly decrease the strength compared to 3 times baking. As stated by the authors, this is an undeniable fact that esthetic results are desired as well as the durability of the restoration. In the present study, esthetic features of the zirconia ceramics that were fired multiple times were evaluated after repaired with intraoral porcelain repair systems. It was stated that in the literature, design of substructure, surface conditioning procedures and number of firing might affect final color of the porcelain restoration [17,19,26,28,29]. However, detailed information was not found about esthetic success of the intraorally repaired restoration in the literature. Esthetic outcome of the repaired restoration is extremely important on account of incident of porcelain fractures on the maxillary anterior region [32,33]. Kirmali et al. concluded that application of various surface conditioning methods could enhance bonding strength between the restoration and the composite resin. Moreover, they advised that to follow instructions manual of the intraoral porcelain repair system. In the current study, intraoral porcelain repair kits were applied in the light of manufacturer’s recommendations. Correct definition of the color is key factor to fabricate restorations with color harmony. Success rate of the restoration can increase carefully selection of the shade . Digital color measuring devices have several advantages compared to visual shade guide systems. The digital devices swiftly present objective data and enable to evaluate color in numerical values [34,35]. A study was conducted to analyze accuracy of spectrophotometer and success rate was reported as 83.3% . Therefore, a spectrophotometer was used to objectively evaluate differences of color and translucency. Gonuldas et al. evaluated effects of repeated firings on the color stability and surface roughness of zirconia ceramics. They reported that increased number of firing caused to more rough surfaces and differentiation in the color. The authors concluded that the technicians should avoid multiple baking processes, when manufacturing the restorations. Yilmaz et al. investigated effects of different number of firing and various polishing techniques on the color features of all ceramic restorations. They found that the multiple firings caused to transformations in the crystalline structure. Thus, the authors reported that differentiations in the color of restoration might occur regardless of polishing techniques. In this study, color differences were observed after the repair parallel to number of firing, irrespective to applied intraoral porcelain repair kits and composite resins. Color differences between the porcelain restorations and the composite resins for porcelain repairing were assessed by AlGhazali et al. and they observed that ΔE values were range from 3.5 to 26.9. Clinically acceptable threshold was applied as ΔE=5.5 in that study they suggested that to use combination of different colors of the composite resin instead of single shade of the composite in order to achieve perfect color match for repaired restorations. In the present study, the mean color change was observed within the clinically acceptable limit in the groups that applied Clearfil repair kit, but color changes for the Ceramic Repair N used groups were found above this level. Limitations of this study were that the maximum number of repeated firings were 7, the other all ceramic materials were not involved in the study and the samples were prepared on the basis of single color. Color change of the group that was fired one time and repaired using Clearfil Repair intraoral porcelain repair kit was under the clinically detectable limit (ΔE=3.7). Although color changes of the other Clearfil Repair system applied groups were above the clinically detectable limit (ΔE=3.7) and under the clinically acceptable limit (ΔE=5.5), statistically significant difference was solely found between the one firing and the seven firings applied groups. Translucency parameters (ΔTP) were showed decreasing trend parallel to number of firing regardless of applied intraoral porcelain repair kits. Color of the repaired zirconia ceramics can be affected by multiple firings and type of intraoral porcelain repair kit. The color changes of the groups repairing with the Clearfil Repair kit were clinically acceptable. But, the Ceramic Repair N repair system applied groups were not within the clinically acceptable range. As if the firing numbers of zirconia substructures are increased, the color and translucency differences can be more after the repair. In addition, further in vitro studies and multicenter clinical trials are required investigating different intraoral porcelain repair systems and other all ceramic restorative materials. This study was presented at 23rd International Scientific Congress of Turkish Prosthodontics and Implantology Association, November 9-12 2017, Mugla, Turkey. Ozcan M and Vallittu PK. Effect of surface conditioning methods on the bond strength of luting cement to ceramics. Dent Mater. 2003;19:725-731. Vichi A, et al. Color related to ceramic and zirconia restorations: A review. Dent Mater. 2011;27:97-108. Lee SJ, et al. Bond strength of the porcelain repair system to all-ceramic copings and porcelain. J Prosthodont 2014;23:112-116. Seabra B, et al. Influence of multimode universal adhesives and zirconia primer application techniques on zirconia repair. J Prosthet Dent. 2014;112:182-187. Akin H, et al. Shear bond strength of resin cement to zirconia ceramic after aluminum oxide sandblasting and various laser treatments. Photomed Laser Surg. 2011;29:797-802. Yamaguchi H, et al. Examination of bond strength and mechanical properties of Y-TZP zirconia ceramics with different surface modifications. Dent Mater J. 2012;31:472-480. Yenisey M, et al. Effect of surface treatments on the bond strength between resin cement and differently sintered zirconium-oxide ceramics. J Prosthodont Res. 2016;60:36-46. Burke FJT, et al. Five-year clinical evaluation of zirconia-based bridges in patients in UK general dental practices. J Dent. 2013;41:992-999. Crisp RJ, et al. A clinical evaluation of all-ceramic bridges placed in patients attending UK general dental practices: Three-year results. Dent Mater. 2012;28:229-236. Vichi A, et al. Effect of repeated firings on flexural strength of veneered zirconia. Dent Mater. 2015;31:e151-156. Monaco C, et al. Microstructural changes produced by abrading Y-TZP in presintered and sintered conditions. J Dent. 2013;41:121-126. Scherrer SS, et al. Fatigue behavior in water of Y-TZP zirconia ceramics after abrasion with 30 mum silica-coated alumina particles. Dent Mater. 2011;27:e28-42. Lorente CM, et al. Surface roughness and EDS characterization of a Y-TZP dental ceramic treated with the CoJet Sand. Dent Mater. 2010;26:1035-1042. Kokubo Y, et al. The influence of zirconia coping designs on the fracture load of all-ceramic molar crowns. Dent Mater J. 2011;30:281-285. Sornsuwan T and Swain MV. Influence of occlusal geometry on ceramic crown fracture; role of cusp angle and fissure radius. J Mech Behav Biomed Mater. 2011;4:1057-1066. Comlekoglu M, et al. Influence of cervical finish line type on the marginal adaptation of zirconia ceramic crowns. Oper Dent. 2009;34:586-592. Gonuldas F, et al. The effect of repeated firings on the color change and surface roughness of dental ceramics. J Adv Prosthodont. 2014;6:309-316. Subasi MG, et al. Mechanical properties of zirconia after different surface treatments and repeated firings. J Adv Prosthodont. 2014;6:462-467. Yilmaz K, et al. The effect of repeated firings on the color change of dental ceramics using different glazing methods. J Adv Prosthodont. 2014;6:427-433. Inokoshi M, et al. Durable bonding to mechanically and/or chemically pre-treated dental zirconia. J Dent. 2013;41:170-179. Son YH, et al. Influence of internal-gap width and cement type on the retentive force of zirconia copings in pullout testing. J Dent. 2012;40:866-872. Capa N, et al. Intraoral porcelain repair systems. J Dent Fac Ataturk Uni. 2006;16:34-40. Yoo JY, et al. Porcelain repair - Influence of different systems and surface treatments on resin bond strength. J Adv Prosthodont. 2015;7:343-348. Kirmali O, et al. Efficacy of ceramic repair material on the bond strength of composite resin to zirconia ceramic. Acta Odontol Scand. 2015;73:28-32. Tokar E and Polat S. Evaluation of intraoral repair methods in terms of color. J Dent Fac Ataturk Uni. 2017. Ozcelik TB, et al. Color change during the surface preparation stages of metal ceramic alloys. J Prosthet Dent. 2011;106:38-47. Matsuzaki F, et al. Translucency and flexural strength of monolithic translucent zirconia and porcelain-layered zirconia. Dent Mater J. 2015;34:910-917. Yilmaz B, et al. Effect of repeated firings on the color of opaque porcelain applied on different dental alloys. J Prosthet Dent. 2009;101:395-404. Ozcelik TB, et al. Colorimetric analysis of opaque porcelain fired to different base metal alloys used in metal ceramic restorations. J Prosthet Dent. 2008;99:193-202. Nakamura K, et al. Influence of grain size and veneer firing process on the flexural strength of zirconia ceramics. Eur J Oral Sci. 2012;120:249-254. Oilo M, et al. The firing procedure influences properties of a zirconia core ceramic. Dent Mater. 2008;24:471-475. Lee YK. Criteria for clinical translucency evaluation of direct esthetic restorative materials. Restor Dent Endod. 2016;41:159-166. Ozcan M and Niedermeier W. Clinical study on the reasons for and location of failures of metal-ceramic restorations and survival of repairs. Int J Prosthodont. 2002;15:299-302. Okubo SR, et al. Evaluation of visual and instrument shade matching. J Prosthet Dent. 1998;80:642-648. Paul S, et al. Visual and spectrophotometric shade analysis of human teeth. J Dent Res. 2002;81:578-582. AlGhazali N, et al. Colour match between porcelain and porcelain-repairing resin composites. Eur J Prosthodont Restor Dent. 2012;20:3-9.